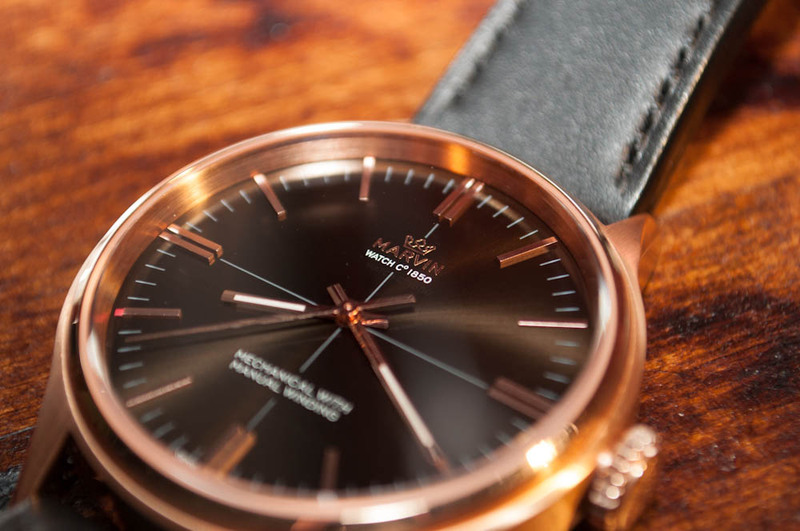 Marvin Watch is one of the most interesting brands out there that us common folk can afford. A combination of history, talent and creative leadership drive the brand and allow it to offer up stylish, clean and high-functioning timepieces without breaking the bank. Marvin sent over two watches this time around, the M112 and M113. I previously reviewed their M117 watch. Marvin is a classic watch-making brand steeped in the tradition of fine Swiss horology since 1850. For over 150 years, it has remained true to its founding principles of passion, daringness, strong ethics and humor. 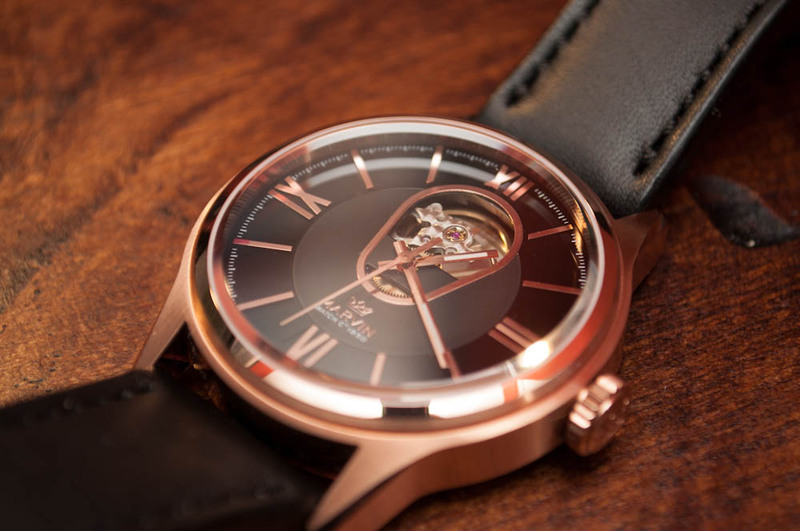 The Marvin brand is known for its tradition of beautiful and reliable time pieces, rich in style and history. Marvin’s elegant and original watches, powered by top-quality Swiss movements, propelled the company to success early on in over sixty countries. And now, once again, Marvin is poised to reinvent the luxury watch. Unique aesthetics and daring designs. Relentless attention to detail and finish. Exclusive and unique concepts. All brought together with technical perfection at affordable prices. 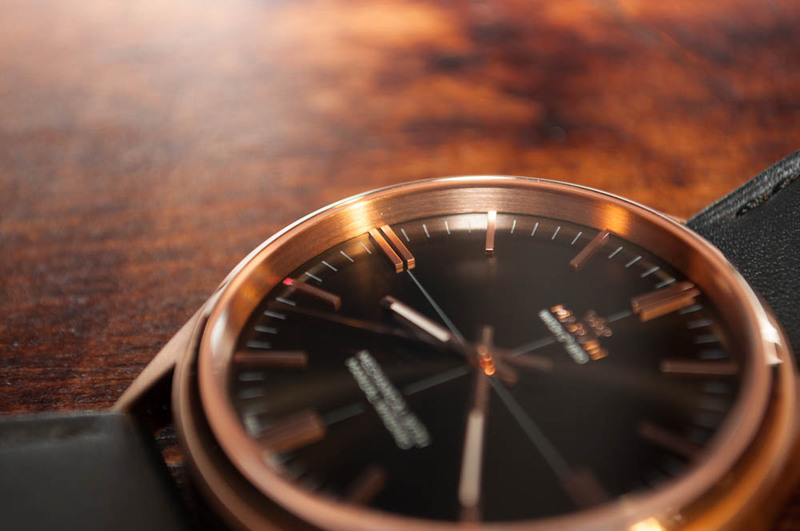 This is what the unmistakable signature of a Marvin timepiece is all about. Out of the box the Model M112 watch can be described with one word; clean. The retro roots of the brand and design are immediately evident, but the modern elements are unmistakable and add to the stately look of the piece. As modern / retro hybrid watches go this may be the best I have ever seen. It is perfectly simply in that it offers an extraordinarily clean face without sacrificing readability. Like many watches from the 1960’s the dial is devoid of numbers relying instead on polished rose-gold hour markers for navigation. The inclusion of a simple white bulls-eye makes reading the watch very quick as you can identify the quadrant the hand is in which seems to make deducing the hour / minutes a bit easier. The tip of the 8 o’clock hour marked is done in Marvin’s signature red. You also get the red on the inside face of the soft leather strap, it is not discernable from the black exterior facing leather when the watch is worn. I dig these little details that only the watch owner gets to enjoy. The buckle is very well crafted and features a Marvin crown logo on it. A really nice touch is that the watch has quick release straps, perfect for those of us that like to mix it up. The M112 departs from its retro styling in that it is a very modern 44mm wide. The perfect size for a modern watch and a great size for showing off the classic styling. The sapphire crystal atop the watch is raised and faceted for an interesting look that catches light nicely and gives the watch a more substantial feel. The rear of the watch has a K1 mineral crystal exhibition caseback to show of the manually wound Swiss ETA 2801 movement. I usually like to see bit more decoration on the movement, but for the price-point I will take a dressed down Swiss ETA any day. When fully wound, the movement offers a 42 hour power reserve. Being manually wound lends to the vintage style of the watch, but to be honest this is another area I would prefer modernization. An automatic version would be absolutely perfect. The dial is quite possibly the best I have seen, it is clean, interesting and striking. The hand and hour markers are polished, perfectly sized and contrast nicely with the polished black dial. The second hand is needle style and adds a nice touch of sportiness to the timepiece. Out in the daylight the sunburst finish on the dial comes to life and looks fantastic. One downside to the retro style theme of the watch is lume, it is nearly non-existant. There is a thin strip of lume in the hour hands, but you will need a bit of light to make any use out of them. The M112 is the definition of clean. The rose-gold, black and touches of red all exude riches well beyond the M112.54.41.64’s $1,290 price. The open heart M113 although quite similar is a bit less subdued than the M112. The hands are identical to the M112 above but the dial features numbered markers at the 3, 6, 9 & 12 spots making it a bit easier to read. Gone is the white bulls-eye, replaced by a matte black center circle surrounded by glossy black ring housing the numerals. Most notably, of course, is the open heart window that allows for a great view of the automatic Swiss Sellita SW 200 movement housed inside. I really like the window size they chose for the M113, it is large enough to view the movement without being so large as to look gaudy. The movement is excellent and comparable to the ETA 2824 and features a 38 hour power reserve. The M113 is slightly smaller at 41mm, but the size does look better when I wear it with a suit than does the larger 44mm. On top sits a beautiful faceted sapphire crystal that reflects light and and illuminates the window nicely. The rear of the watch has a K1 mineral crystal exhibition windows which allows you too look straight through the watch. The M113 is stylish and modern without losing the retro styling Marvin is known for. With the rose-gold and contrasting black in matte and gloss finishes the M113.53.44.64 will always have you looking well dressed at $1,590.